Smartphone Data Recovery | Cell Phone Recovery | Gillware Inc.
We are more glued to our phones now than ever before. The modern smartphone is a miniature Internet-enabled computer, capable of keeping you in touch with family and friends no matter the distance. We store increasing amounts of data on their phones, from text and voice messages and contacts to pictures, videos, and music. Of course, being so small and so frequently-used, phones are vulnerable devices. They can be dropped onto a hard surface or into a pool, lake, toilet, etc. They can be stepped on or run over. Water can get spilled on them. Or they can just die on you. If you’ve lost irreplaceable data on your smartphone, don’t wait to contact the phone data recovery experts at Gillware for help. Gillware’s smartphone recovery experts have the data recovery and forensic know-how to deal with the wide variety of mobile phones on the market today. When something happens to your smartphone and you realize you’ve lost important data you didn’t have backed up, now is not the time to panic. Now is the time to contact Gillware and find out how we can help. Where Does Data Live on Your Smartphone? Compared to computers, a smartphone’s inner workings are a mystery to most people. Generally, the data on your phone can live in two places. Connected to your smartphone’s motherboard is an eMMC or eMCP chip. These are a special kind of NAND flash memory chip ideal for devices such as smartphones. Smartphones also have a hidden slot for a microSD card. Not all smartphones come with microSD cards preinstalled, but they are somewhat easy to install, remove, and replace. It only takes a minute or so of simple disassembly. What Are eMMC and eMCP Chips? Inside a USB flash drive or solid-state drive are the NAND chip(s) and a controller chip. The chips are soldered to a printed circuit board. All of the data inside the drive lives on the NAND chips, but not in a form you would recognize. When data passes through the controller chip, the controller organizes the data into something you can make sense of. Inside your phone, however, is a different type of NAND flash memory chip. The eMMC, or embedded multimedia card, has its controller integrated into the chip itself. You’ll never find an eMMC chip inside a solid-state drive; their performance is far slower than normal NAND chips. But eMMC chips are preferred for phones and more affordable models of tablet. eMMC chips are cheaper to produce than normal NAND chips, and have a size advantage as well. An eMMC chip frees up space on the PCB and allows the manufacturers to work with even smaller form factors. And an eMCP chip frees up even more space than an eMMC chip, because the RAM chip is integrated into it as well as the controller. 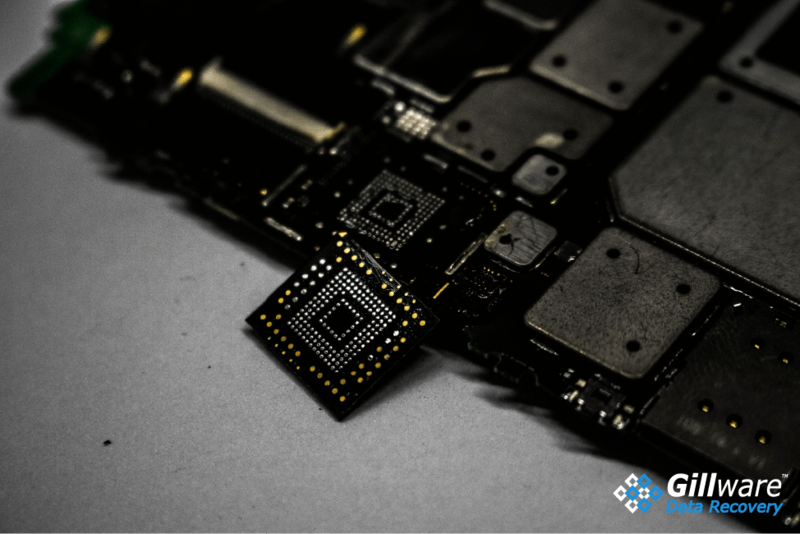 While still slower than the NAND chips in your SSD, eMCP chips offer improved performance over eMMC chips. 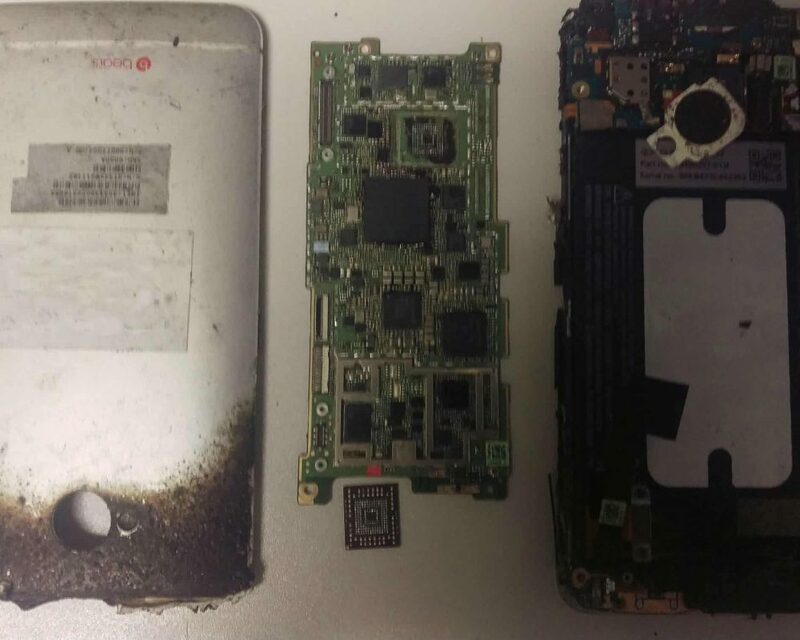 In many mobile phone data recovery cases, the phone has to be completely disassembled. This is the only way to get at the eMMC or eMCP chip. After the phone has been stripped down, our mobile phone technicians can remove the chip. The chip can then be popped into a chip reader and imaged. Because the eMMC chip has a controller integrated into it, this is a simpler process than the raw NAND flash memory dump used for some other solid state memory recovery situations. Reading an eMMC chip (with the proper tools) isn’t much different from reading an SD card. If for some reason or another, the memory chip cannot be removed from the motherboard, our engineers can use the JTAG data extraction method. The JTAG method allows data to be read from the memory chip without removing the chip from the phone’s motherboard. Wires are connected to specific contact points on the motherboard that lead directly into the chip. Many phone manufacturers disable JTAG access before the phones are assembled and shipped off. However, when it can be used, it is a powerful data recovery technique. Salvaging data from smartphones can be tricky. Every model of phone is built and programmed just a little differently. Our mobile phone technicians often test data recovery methods on identical “dummy” models. At Gillware, our data recovery experts use forensics tools such as Cellebrite in conjunction with our own proprietary data recovery software tools to access and salvage data from smartphones. Your phone isn’t formatted for Mac or Windows (unless your phone uses Microsoft’s Windows 10 Mobile O/S). Rather, your phone has a filesystem and operating system of its own. An iPhone uses the iOS operating system, while many other smartphones use Google’s Android operating system. The Android O/S is open-source, so there are many variants of it for smartphones and other devices. This phone had suffered severe damage, but our data recovery experts were able to remove its eMMC chip and recover its contents. Android is based on the Linux kernel, so Android mobile devices have Linux filesystems. There is a wide range of Linux filesystems due to the open-source nature of Linux. Our mobile phone data recovery technicians must be well-versed in all flavors of Linux OSes, from Btrfs to ZFS. It’s common for Android eMMC chips to be formatted with Ext4, or with F2FS, a filesystem designed with the unique characteristics of NAND flash memory chips in mind. While the technology behind the iPhone isn’t so much different from Android phones, the filesystem architecture is very different. Whereas Android mobile phones use open-source Linux filesystems, iPhones and iPads stick with Apple’s proprietary HFS+ architecture. Our data recovery technicians are very well-acquainted with Apple filesystems and are well-versed in recovering lost, deleted, or corrupted data from these devices. Why Choose Gillware for Your Mobile Phone Data Recovery Needs? Gillware’s engineers work hard to push the boundaries of Android and iPhone data recovery. While in many smartphone recovery cases our client’s phone itself has died, there are many other cases in which our clients have accidentally deleted personal data, such as photos of their last family vacation, or have lost an important list of text messages or contacts. Recovering data from a healthy phone can actually be a lot different, and potentially more challenging, than recovering data from a badly damaged phone. Recovering deleted files from a phone doesn’t tend to be much different than doing the same from a hard disk drive. Accidental reformats and system restores prevent much greater challenges for phones, though, than hard disk drives. Some models of Android phones are self-encrypting, and all modern iPhones (from the iPhone 4s model and up) are self-encrypting by default, similar to many SSD models. As is the case with all encrypted storage media, access to the data is verboten without the unique encryption credentials. The encryption key can be lost if the controller fails, or when an encrypted smartphone is factory reset. Factory resetting, in particular, is especially dangerous creates a new encryption key and overwrites the old one. With some of the best and brightest minds in data recovery and digital forensics gathered under one roof, Gillware is the best choice you can make when you need data recovered from a smartphone. Our mobile phone experts are highly trained and highly skilled. In our data recovery and digital forensics labs, we’ve recovered data from phones that have been dropped, run over, burned, and drowned, smashed in a motorcycle accident, and run through every other wringer imaginable. We’ve turned mobile phones too damaged to work into fully-functional Frankenphones. Our in-house data recovery tools and techniques, which are used by both our data recovery lab and our digital forensics lab, are cutting-edge. In addition to charging nothing for our evaluations, we even cover the cost of inbound shipping. One of the catalysts for the formation of our digital forensics services several years ago was the fact that so many of our mobile phone cases were coming from clients in law enforcement and legal professionals needing data recovery for civil or criminal litigation. If you work in law enforcement or in the legal industry and need data recovered from a smartphone, please reach out to our mobile forensics experts.